Age Group Reading Lists: It is not possible to create an all-encompassing reading list of great literature for each age group, but we did our best to create some top picks of stories and poems, read-a-loud books, and fiction and non-fiction literature for each age group. Here are hundreds of stories gathered from the Golden Age of children’s literature of a hundred years ago – a time when stories were extensively used to warm hearts. Re-tell or read aloud these stories to awaken a love of nature and science, history, great literature and art. You will “feel” the difference. The stories from this series are included in the Story Resource Guide from Well Educated Heart. Learn more about the Story Resource Guide on our Stories of History page. These stories may be included in either your family's History Story Hour or Bedtime Story Hour. People have fond memories of hours spent with this remarkable set of books, the creation of one woman, Olive Beaupre Miller, who drew from her reading and travels to design a treasure trove of literature that grew from nursery tales to epic poetry as the series of books progressed. Everything from the writing, to the illustrations, to the bindings, to the publishing, marketing, and sales by a team of women, resulted from the evolving vision of one person. That is what makes these books unique. ​Check out this blog post for a thorough review of the My Book House Series. "This set of books was a part of my childhood, and instilled in me a love of reading that persists to this day. Each volume begins at a grade level---One being the easiest to Twelve being suitable for high-school level reading. There are selections from some of the finest writers, such as Jonathan Swift, Robert Louis Stevenson, and Rudyard Kipling, as well as fairy tales and folk legends from all around the world, both East and West. The illustrations are gorgeous and some of the monsters quite scary, but there is nothing extremely gruesome or inappropriate for young readers. From the simple and charming nursery rhymes of the first volume to the more mentally and emotionally challenging material contained in the last volume, these books take their reader on a marvelous journey through worlds both real and imaginary. This is a delightful way to open up a child's mind to reading." 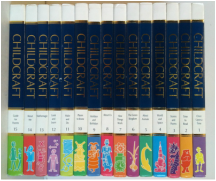 Childcraft Encyclopedias (Volumes 1-3): If your family happens to own a set of Childcraft Encyclopedias, you will find many wonderful stories and poems in the first three volumes. Many stories and poems in Volumes 1-3 are appropriate for all reading levels. Parents and teachers are encouraged to select appropriate stories for their own children. For your convenience, we have cataloged the stories by monthly theme in the Stories for the Heart Reading Guide for children ages 0-8.